If you’re an aquarium enthusiast, you no doubt have many beautiful and colorful tropical fish populating your aquarium. Perhaps you’ve studied the different species carefully to be sure they can peacefully co-exist. You know what they like to eat and what water conditions help them thrive. Here’s a question though — did you investigate to see whether the type of fish you wanted to buy is in danger in its natural habitat? Did you ask whether it was captive-bred? Many people don’t. 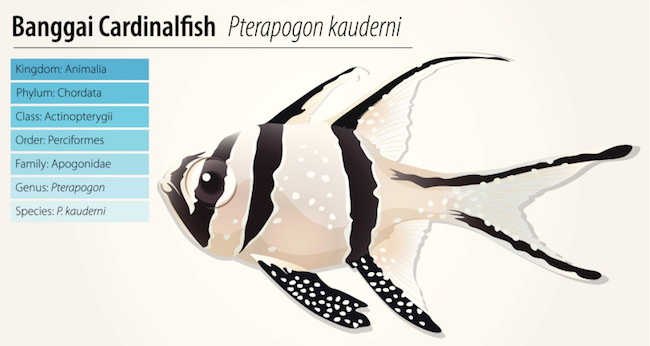 In the case of the Banggai cardinalfish, its amazing popularity is threatening its very survival in the wild. 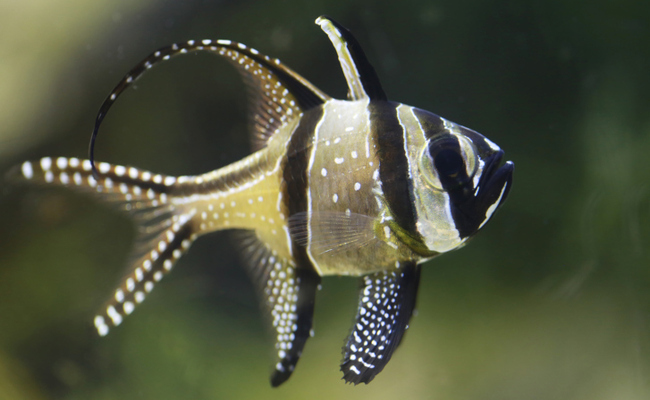 Demand is high for Banggai cardinalfish in the U.S. and around the world. It’s not hard to understand why. This is a gorgeous saltwater fish, sporting an iridescent silver body with vertical black stripes and delicate white spots. Not just beautiful, it’s also considered an easy fish to keep and maintain, even for those new to tropical fish care. For tropical aquarium fans, it’s an unbeatable combination. That ever-growing demand sadly feeds an industry that populates pet store tanks with Banggai cardinalfish taken from the wild. While you might expect that such a fish can be found in abundance at many tropical spots around the world, that’s not the case. The cardinalfish lives in only one small geographic range of about 3,200 square miles near the Banggai Archipelago off Sulawesi, Indonesia. Within that area, the available coastline habitat to support this species is a mere 21 square miles. That’s it. In addition, it’s ridiculously easy to catch this species. They live only in shallow water about five to eight feet deep, making them easy to see and harvest. Overfishing of this species has been a critical problem for some time. In 2002, experts estimated that out of a total population of perhaps 2.4 million Banggai cardinalfish, about 600,000 were being harvested each year. By 2005, that number had ratcheted up to a worrisome 900,000 fish per year. In 2009, some estimated that fishermen were taking an incredible 1.8 million fish per year. They take so many because an estimated 55 percent of wild-caught cardinalfish do not survive long enough to make it to a pet store. The decimation of this species has to stop — soon. There are captive-bred sources of Banggai cardinalfish, of course, but this fact does little to stem the tide of profitable overfishing. 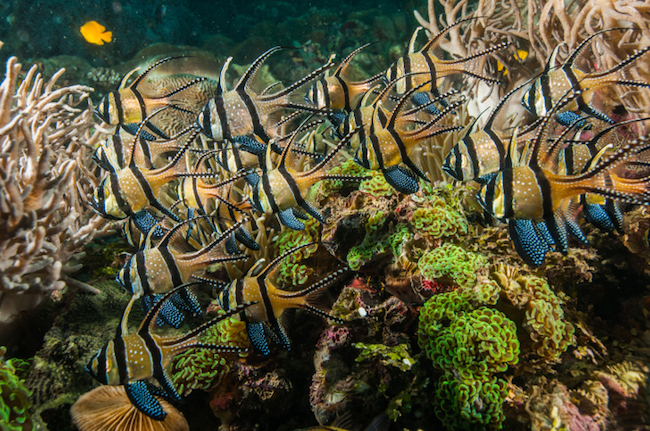 With little to no management of Banggai cardinalfish locally, the problem continues to grow. In response, the International Union for Conservation of Nature (IUCN) listed the Banggai cardinalfish as “endangered” in 2007. The U.S. proposed adding the species in 2007 to Appendix II of the Convention on International Trade in Endangered Species of Wild Fauna and Flora, but pressure from Indonesia caused the U.S. to withdraw the proposal. That’s unfortunate; such a listing would have regulated the trade in cardinalfish much earlier. Looks like economic considerations trumped conservation worries. Now, nine years later, the U.S. Fish and Wildlife Service (USFWS) has taken action as well, listing the Banggai cardinalfish as “threatened” under the Endangered Species Act (ESA). Notably, this is the first saltwater aquarium fish to be so listed. Sit up and take notice, aquarium fans. This listing may eventually affect you directly. For now, the ESA “threatened” status of the Banggai cardinalfish comes with no restrictions aimed at aquarium owners. Relax for now, but keep an eye on the situation. Prohibitions could change in the future, depending on how USFWS decides to handle the issue of differentiating between captive-bred and wild-harvested specimens. If it decides certain prohibitions are needed for the aquarium trade, the Service says it will propose protective regulations after public notice and comment. However, the people who can make the most difference — quickly and directly — are responsible aquarium owners. Be accountable for your choices. Don’t wait for federal regulators to do something. Do it yourselves. For any fish you want to buy, look into the facts a bit. Is the species you’re interested in having trouble in the wild? Is your purchase of such a species fueling that trade? Research the provider from whom you’re obtaining your tropical specimens. Can it prove to you that it’s selling you legitimately obtained, captive-bred species? Or is it playing fast and loose so it can give collectors the tropical creatures they want, no matter the ecological damage done? “My little aquarium doesn’t matter in the grand scheme of things,” some might argue. That’s just not true. A problem of this magnitude is the sum of its individual parts. Every aquarium with a cardinalfish contributes to the over-the-top demand for this species. If you have cardinalfish, you’re part of that demand. Do your best to be a responsible aquarium enthusiast. These are more than pretty creatures that flit around in the water as living decorations in your home, after all. They have a rightful place in the wild and on this Earth with us. I recommend to anyone who wants to keep this fish--please buy aquacultured fish, not wild caught! Aquariums don't interest me unless they are big enough and maintained to be the same as a mini-ocean, and nobody but multi millionaires can afford that, so the rest of the aquarium fadists are just uninteresting animal imprisoning slobs. Sorry, I meant 10 gal./inch of fish for optimum health. So the Banggai tank pictured above should be at least 200 gals. Also notice the corals and other marine organisms; saltwater fish live better and longer with a full complement of symbiotic microfauna. Such a tank costs thousands to set up and maintain. Even for freshwater goldfish, which don't require special conditions, you should follow this rule. For a 1-inch goldfish to be healthy and happy enough to grow a little, it should have at least a 10-gallon tank with live plants and a good filter/bubbler (without water circulation/pumping fish will die, as anoxia will set in. Bettas are an exception because they can breathe air in a pinch, but they prefer breathing water! They also need plants, filter and care). People who put Goldfish or Bettas in tiny bowls without live plants, bubblers or filters are dooming them to a slow death. Live freshwater plants help a lot as they filter out the ammonia that builds up and condition the water, otherwise you have to change the water frequently which is bad for the fish. They also provide oxygen and some greens to nibble. Natural rocks/pebbles/sand help anchor plants and provide comfy nooks. Think of being stuck in a tiny apt. with no plants or furniture...but that's what most people do to their fish. I didnÂ´t know anything about this!